Rattlesnake from David Hamilton on Vimeo. Wow, that’s nuts. Glad everyone is safe. I think “totally letting his rattle off” is code for get the f— away from me before I bite your a–. Just sayin’. hehe. He was far enough away that it was not a danger. When I was at Skidmore I worked a fair amount with a herpatologist whose specialty was rattlesnakes, I learned a lot about them. I was far away from this snake’s striking range when I recorded this. My wife would have been in the next town by the end of the video shoot. How cool is that?! A bluffing snake! 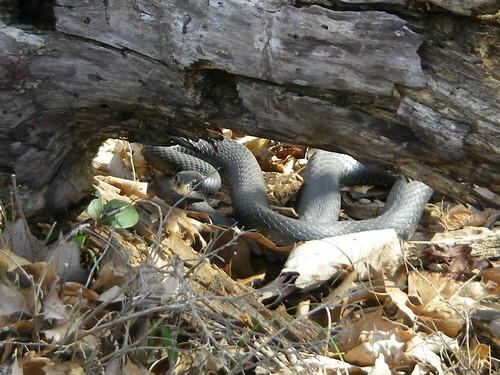 They also ask for reports on any sightings since apparently this snake is rare. anyway, don’t know if this is what it was, but thought you would find it interesting. Thanks for the heads up! Who knew – now Susan and I can return to that bluff, we had been avoiding it. I posted a comment to flickr and tried to report the black racer to that site – the guy’s webform is broken so I emailed the only email address I found in the form.